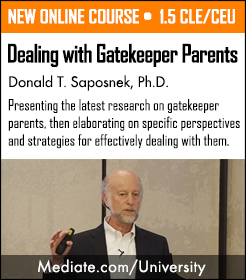 This 1.5-hour course describes the current research on Gatekeeper parents, who present unique challenges to divorce professionals. Gatekeeping behaviors range on a continuum from facilitative gatekeeping (encouraging the other parent to spend time with their child) to restrictive gatekeeping (sabotaging and preventing the other parent from spending time with their child). The unique underlying intrapsychic, interpersonal, and larger systemic dynamics of Gatekeeping behaviors are elaborated and illustrated. Then, specific strategies for effectively managing Gatekeeper parents are offered for mediators and attorneys. with Donald T. Saposnek, Ph.D. 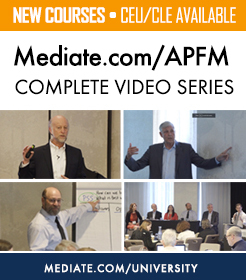 Featuring Donna Petrucelli, Jim Melamed, Chip Rose, Don Saposnek, Amanda Singer. Moderated by Michael Aurit.